The aim of work package 10 was to perform full scale assessment of fundamental influences on system performance, such as mooring response, tidal flow turbulence and marine fouling. 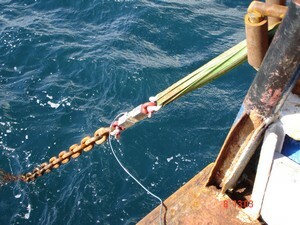 The mooring tests were conducted in Scapa Flow at Orkney, including a preliminary test phase using a 22m chain, detailed investigation of mooring characteristics using a 22mm chain and, finally, detailed investigation of three different mooring arrangements including wave and current measurements. The moorings were 22mm chain, 40mm fibre attached to 38mm chain and 40mm fibre rope attached to a floater and sinker buoy. An 82 Tonne vessel was used to conduct all experiments in an average water depth of 23.5m. WP 8 contributed to the design of these large scale experiments. The top end motion of the vessel and the resulting line tensions were measured as well as the tidal changes and the environmental loadings due to currents and waves. The suitability of chain and/or fibre rope mooring line arrangements for floating wave energy converters were investigated in terms of their effect on "top end" dynamics of the device and the resulting line tension characteristics. A simple catenary chain arrangement, a compliant hybrid mooring arrangement and a taut mooring arrangement in z-configuration were tested to investigate the load, stiffness and damping properties for these slack and taut arrangements. The experimental outcome was also compared by simulating these tests with the commercial software 'OrcaFlex' and demonstrated the capability of a numerical model to simulate the mooring behaviour at large scale. The catenary chain arrangement with large compliancy, where the submerged mass provides the restoring force, was found not to be an efficient means for the station keeping of floating wave energy converters. Significant anchor and fairlead loading was observed in addition to large variation in stiffness and damping behaviour. These criteria were found to be more moderate for the hybrid mooring arrangement, whilst the observation for the taut arrangement provided the best station keeping criteria at low loadings. The test programmes confirmed the conclusions of WP8. 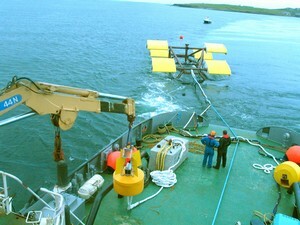 The Robert Gordon Sea Snail tidal test platform was modified for the collection of tidal current data by incorporating transducers and was installed in Burra Sound in 2005. 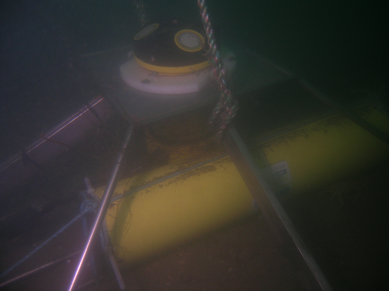 Its deployment and subsequent removal generated important lessons for WP3 about the handling of large scale instrumentation in energetic tidal environments. Adoption of more advanced marine instrumentation during the progress of the project allowed the original sensor array to be replaced by a high frequency Acoustic Doppler Profiler system for the next deployment in Burra Sound in 2006. This generated an enormous amount of high resolution data which, when analysed, identified that turbulence levels cannot be simply expressed in terms of proportions of the ambient flow and that the structure is spatially and temporally complex. The turbulent structure appears to contain "memory" of previous conditions. High and low resolution data was also collected in the deeper Falls of Warness, in association with the European Marine Energy Centre (EMEC) and has given confidence in the findings across different tidal environments. The data is a comprehensive set of tidal current measurements that will enable future determination of temporal and, indirectly, longitudinal statistics through the water column throughout a spring-neap cycle. The study and data collected has enabled systematic study of full scale mooring and turbulence parameters crucial for assessing the interactions between the technology and the environment.